We need to develop vocabulary not only to crack vocab questions in competitive exams but to communicate effectively. The latter one is very important in today's globalized world. But one question which always linger in your mind is where to start. Usually an educated adult enjoys vocabulary near to 4000 words. But most of these words are not used in our speaking but for academic writing. There are two types of vocabulary we need to develop. 1. Passive vocabulary: Passive vocabulary is a set of words which we can easily recall the meaning of the word. For example, If I ask you what is the meaning of Recalcitrant, you may recall that it is a word related stubborness. It is possible to recall the meaning for either you have already read the meaning of this word or by using roots and suffixes you may guess the meaning. To crack vocab section in examinations, it is necessary to develop Passive vocabulary. 1. Learning through roots: Most of the english words have their origons in various languages like latin, french etc. These origons are roots of the words. Besed on these roots loads of words have been formed. Some times even upto 20 words. For example, PAN means all or complete. Panacea means a medicine which cures all, Panaroma means a complete view. So just by learning a few roots, you can develop significant vocabulay in short time. The best books to develop vocab through roots are 'Word power made easy" by Norman Lewis and "Six weeks to word power" by wildred funk. 2. Learning words in groups: Most words in english give almost similar meanings. 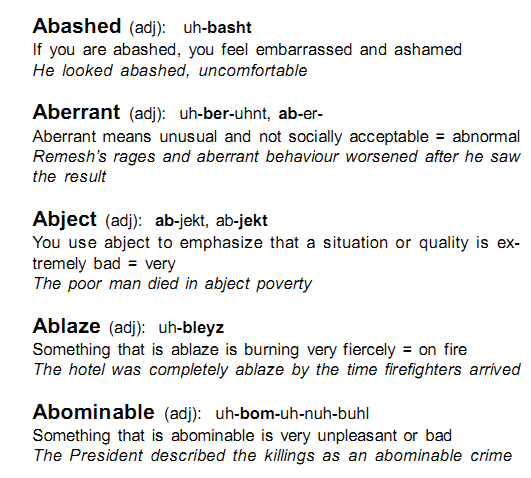 These words are called synonyms. For example, a word confusion has a lot of synonyms. But remember, no word is exact substitute to any word. All these words communicate almost the meaning of confusion. But you may ask how many words we need to remember? The answer is you just have a look at the meanings in any standard dictionary and try to imagine the contest where this word is used. In this way you can remember some of these words if not all. Over a period of time you can remember almost all the words. Remember, developing vocabulary is a long term process but it pays in the end. 3. Vocabulary software: A software called "Vocabulary Wizard" is extremely good to develop vocabulary. It pronounciates all the 4000 important words which are divided into several word lists. It has also got different word lists for SAT, GRE etc. Highly recommended. Click here to download free version. 4. 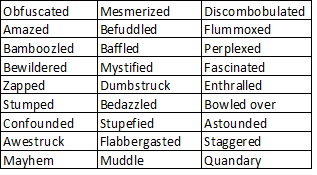 Mugging up standard word lists: you can pick up any books on SAT, GRE and try to recite these words as often as possible. It takes almost 3 months to develop vocabulary. First month you can remember 600 to 900 words, second month 1200 to 1500, Next month upto 3000 words. Active vocabulary is a word bank which we use in our daily language without much effort to recall. For example, in words heavy rain and strong wind, we can remember the words heavy and strong very easily. But we may not be able to use Political Ideology, Novice Law-clerk in our daily language. The reason is to communicate in our daily lifes we don't really need these words. That is why, you may not listen much of these combinations. Most of these words are topic specific. But if you really want to develop good vocabulary you need to develop vocabulary with collocations. Collocations are the most important word combinations. If you look at the above word list you can see in what contexts the words are being used. In this way you can develop vocabulary which you can use in your daily language and for good academic writings.